Dit duo activeert het celmetabolisme en stimuleert de regeneratie. Vermoeide, rijpe en gestreste huid is zo snel gevitaliseerd en afgezwakt. Een superhandige katoenen tas wordt gratis meegeleverd. Deze kun je bijvoorbeeld gebruiken als groentenetje! Duschgel: Aqua*, Glycerin*/**, Coco Glucoside*, Melissa Officinalis Water*/** (Melissenhydrolat), Disodium Cocoyl Glutamate*, Lactobacillus Ferment*, Polyglyceryl-10 Laurate*, Sesamum Indicum Seed Oil*/**, Citric Acid, Sodium Cocoyl Hydrolyzed Wheat Protein*, Cynara Scolymus Leaf Extract*/**, Leuconostoc/Radish Root Ferment Filtrate*, Tussilago Farfara Flower Extract*/**, Rosmarinus Officinalis Leaf Extract*/**, Lactobacillus*, Xanthan Gum*, Helianthus Annuus Seed Oil*, Sodium Cocoyl Glutamate*, Cocos Nucifera Fruit Extract*, Parfum (Essential Oils)*/**, Humulus Lupulus Extract*, Limonene***, Citronellol***, Linalool***, Geraniol***. 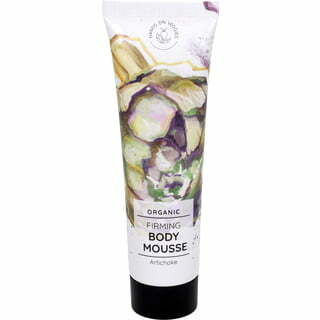 Body Mousse: Aqua*, Melissa Officinalis Water*/**, Sesamum Indicum Seed Oil*/**, Butyrospermum Parkii Butter*/**, Lactobacillus Ferment*, Glyceryl Stearate Citrate*, Vitis Vinifera Seed Oil*/**, Cocos Nucifera Oil*/**, Glycerin*/**, Lactobacillus*, Cynara Scolymus Leaf Extract*/**, Tussilago Farfara Flower Extract*/**, Cocos Nucifera Fruit Extract*, Rosmarinus Officinalis Leaf Extract*/**, Helianthus Annuus Seed Oil*, Humulus Lupulus Extract*, Xanthan Gum*, Citric Acid, Parfum (Essential Oils)*/**, Hydroxystearyl Alcohol*, Hydroxystearyl Glucoside*, Limonene***, Citronellol***, Citral***, Linalool***, Geraniol***.